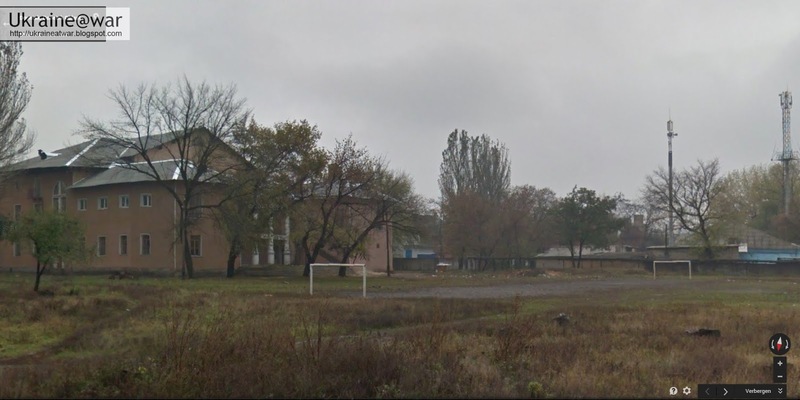 School No63 in Donetsk has been hit, with two children dead. shows how the fence is bent INWARDS. It means the shell must have come from the LEFT side. 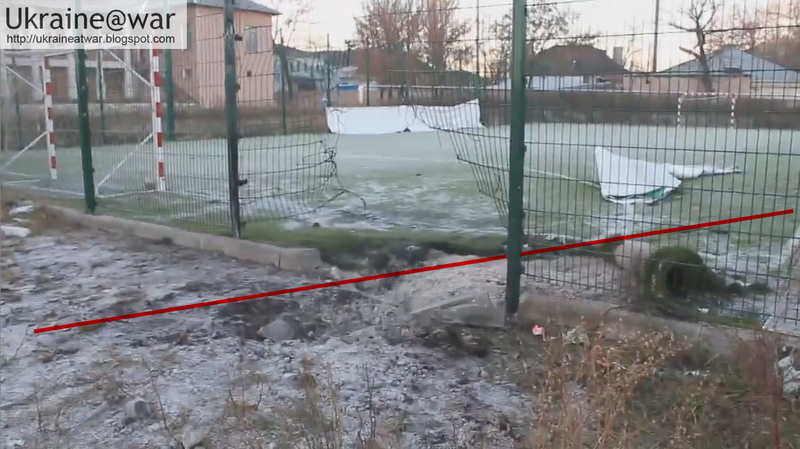 shows where the shell hit the ground and exploded. 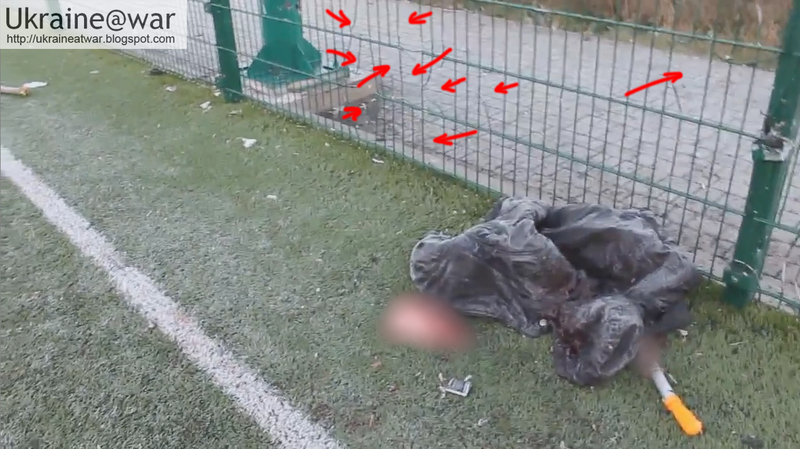 The two dead children are covered behind it, where the people are. 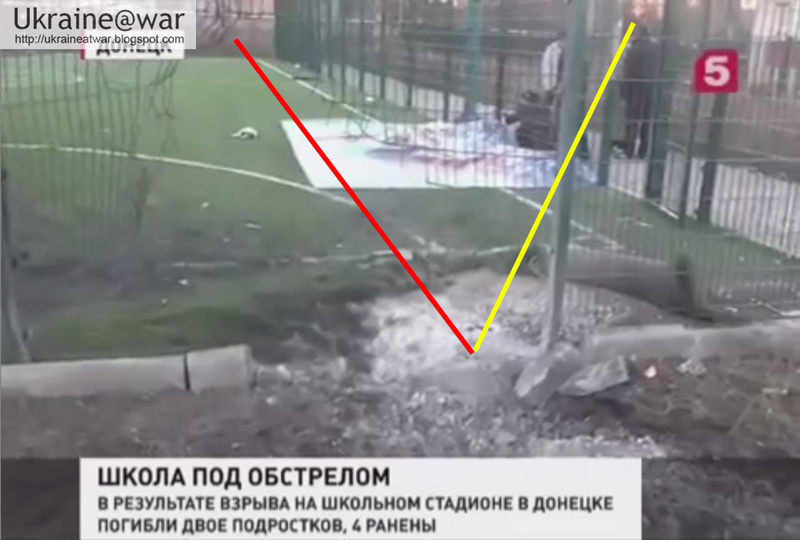 It is clear that the shell bent the fence and not the explosion, because the right part of the fence is not bent at all where the explosion hit. 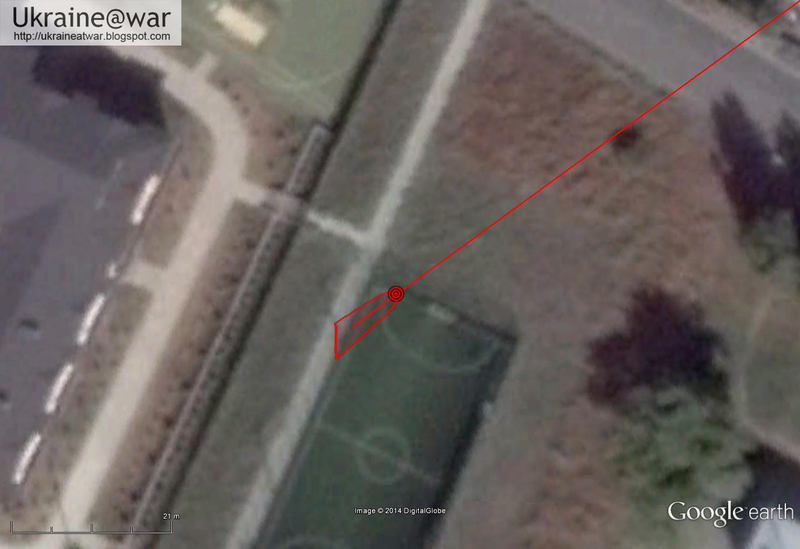 Now we can draw a line from the position where the shell hit the fence to where it exploded (upper red line). Drawn on the ground this gives the direction where it came from (lower red line). shows the same building on the background as on the facebook photo and the same sportsfield in front of it. The difference is that Streetview has a dated photo without the fence, which is newly build there. 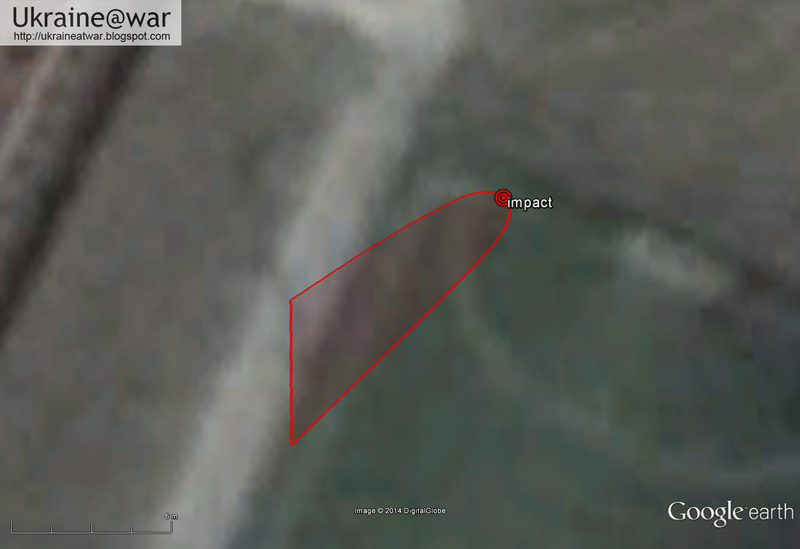 The red arrow shows from which direction the shell came. The shell came from the direction of Makeevka. 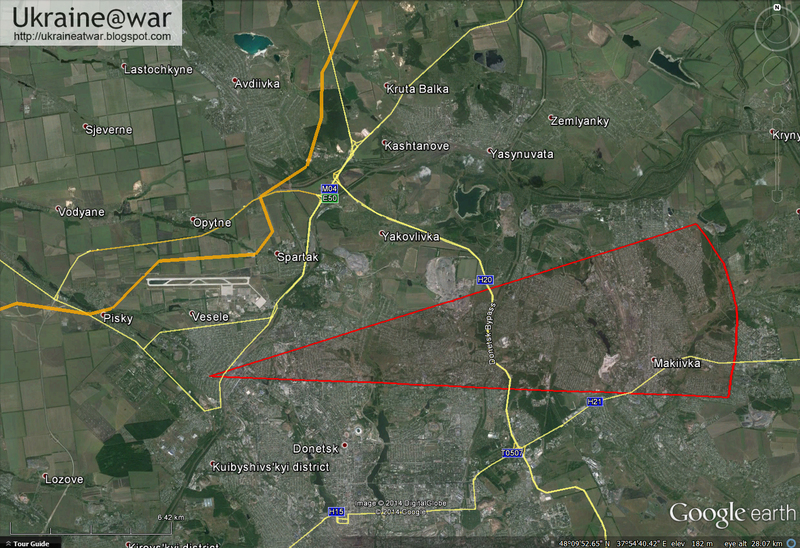 All that area is Russian occupied area. 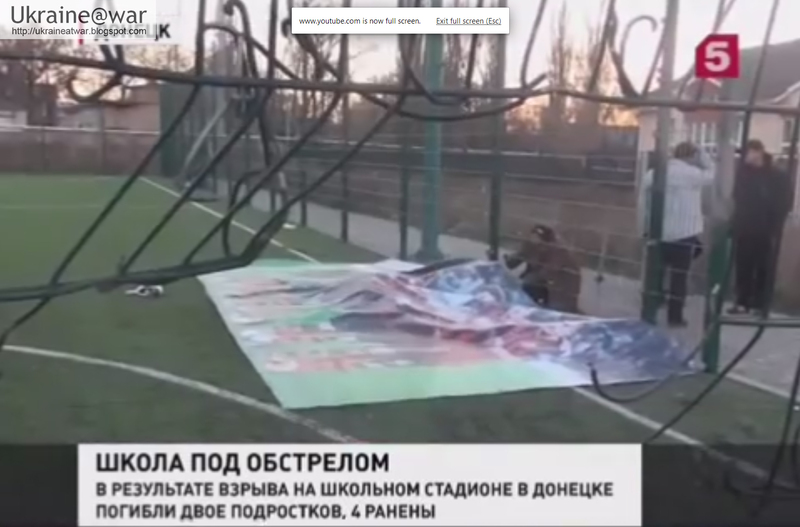 The Russians shot the shell and try to blame and frame Ukraine with it. 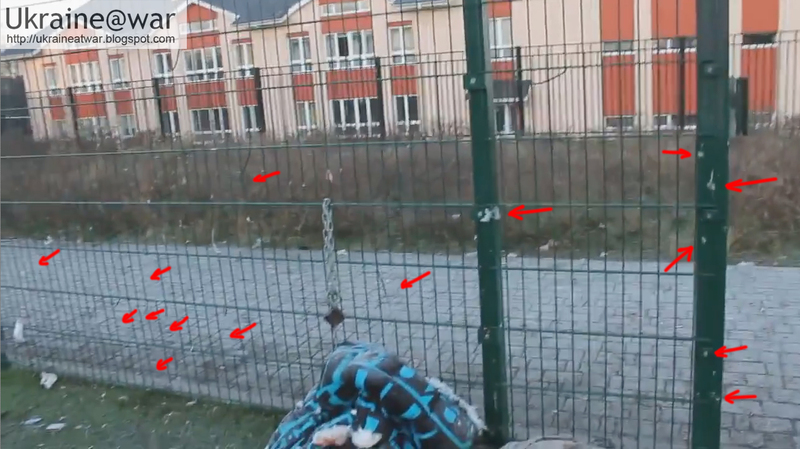 My previous analysis got a lot of attention and not everybody agrees with it :D.
The stones forming the edge in front and outside the fence are pushed OUTWARD from the fence/field. This means that the explosion happened BEYOND the stones and not IN FRONT of the stones. 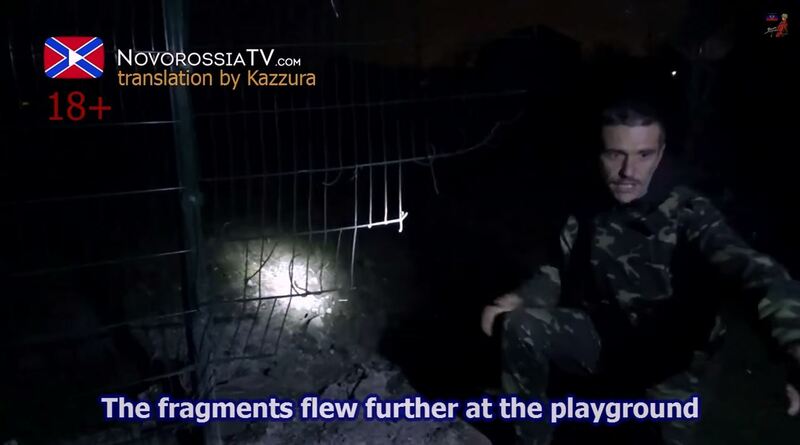 It means the explosion did not happen in front of the fence. 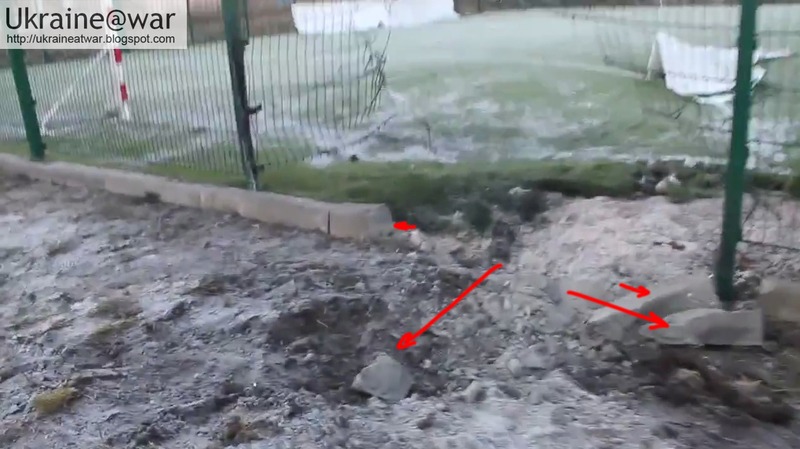 Most likely the shell hit the fence first, ripping it open and bending it inwards and THEN hit the ground BEHIND the stone ridge pushing these stones backwards. 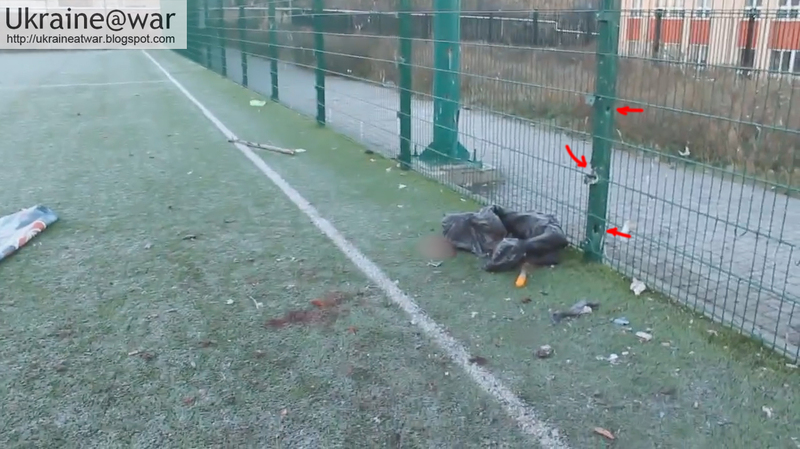 Another indication that this is indeed the case, is the damage on the green, steel pole holding the fence. There are a few scratches on the INSIDE (left arrows) and all the paint is gone on some area at the right side (right arrows). It has hardly any scratch or damage. But it is hard to see what exactly it is. Either it is on the side of it, or it is because it is bend and ripped open too, like the fence. 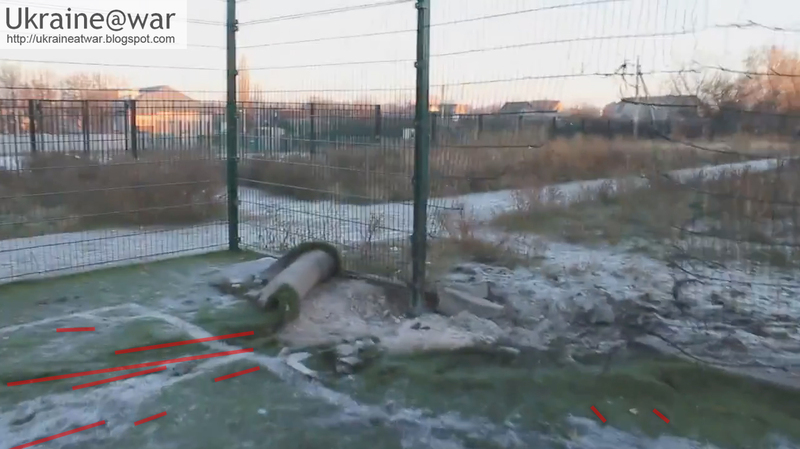 Either way the right pole, where the explosion was closest does NOT show damage OUTSIDE, indicating the explosion was (just) INSIDE the fence/field. It has many big and small holes (click to enlarge). Note how the pole next to the jacket has severe holes, but the pole next to the exit has only scratches. Also the much larger pole behind the fence has severe holes. 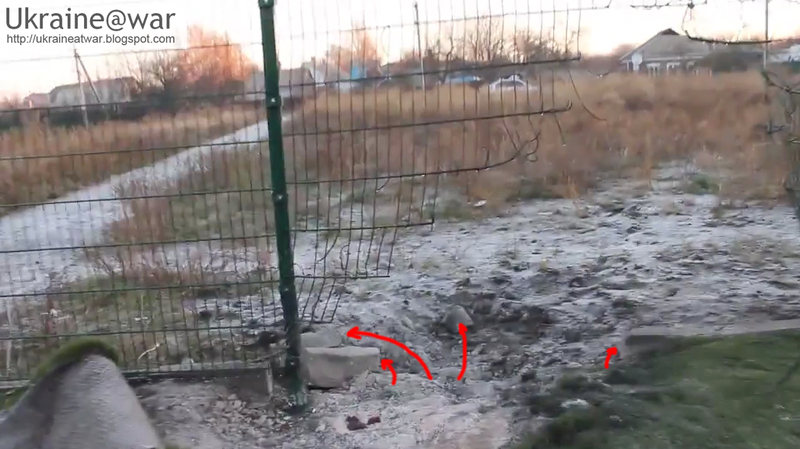 That was the direction of the blast and that is why the pole next to the exit has minor scratches and the pole and fence in the middle of this blast is severely damaged. This is much more Northwards than in the first assessment, but it is still all Russian occupied territory and impossible for Ukraine to have fired this. One little precaution should be taken. If the shell had hit the fence first, it might have slightly changed its course. 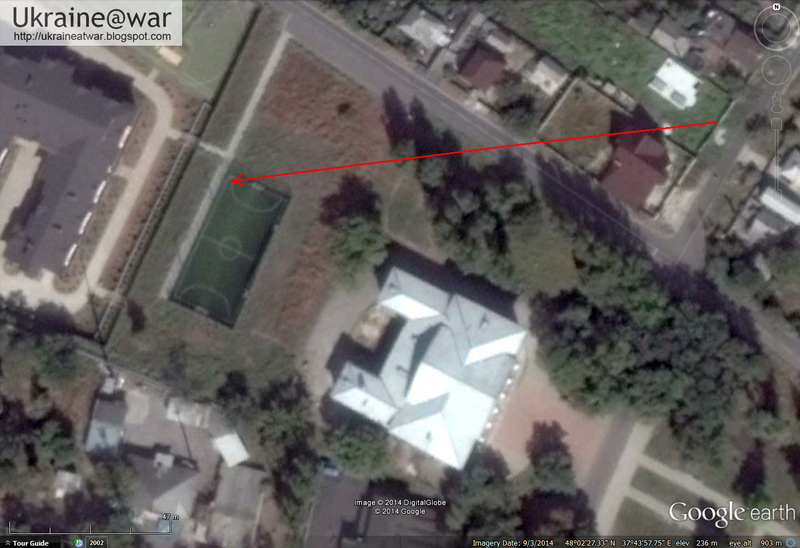 Because the rocket hit the car first it changed course before it penetrated the ground at a different angle. Could something like this have happened too? Of course, but only within the parameters of physics. If the shell would have come from the NW it would had to follow the yellow path. It would have hit the pole and it would be strange that the fence is ripped open at another location. The red line though shows a path that could be possible. If we assume that something like that DID happen... how could the blast area with this distinct (and different) direction have happened? Maybe the folded grass gives a clue? 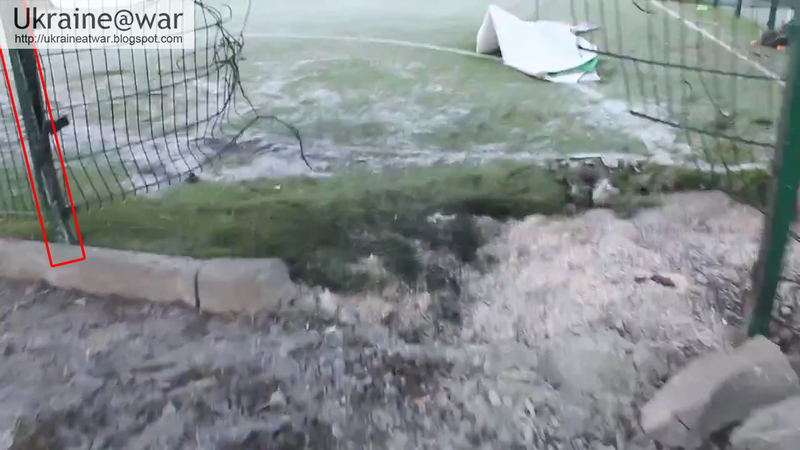 On that side most of the shrapnel was dampened by the soil and grass. Outwards of the fence the shrapnel was blocked by the stone bars and to the left most of it because this opposed the direction of impact. 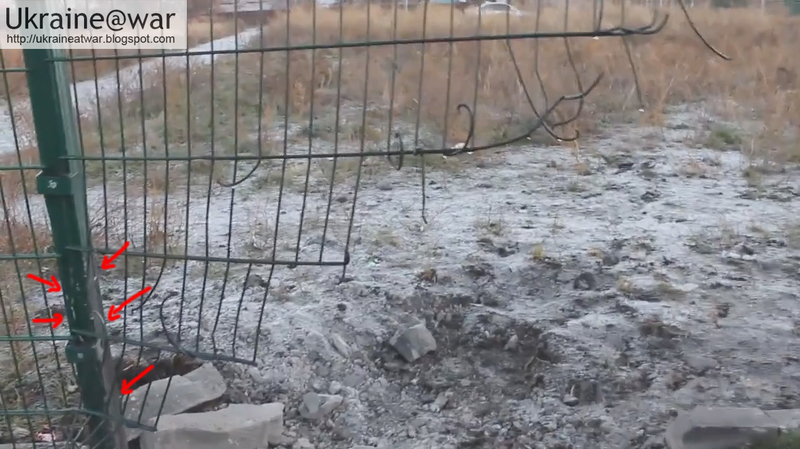 Even with the new more detailed assessment, this shell still could not have come from NW Ukrainian side. The fact that DIFFERENT shell types had been used, as indicated by the OSCE-report, is proof that MULTIPLE sources fired into this location simultaneously in a coordinated attack. This may also mean that they fired FROM DIFFERENT LOCATIONS and directions. 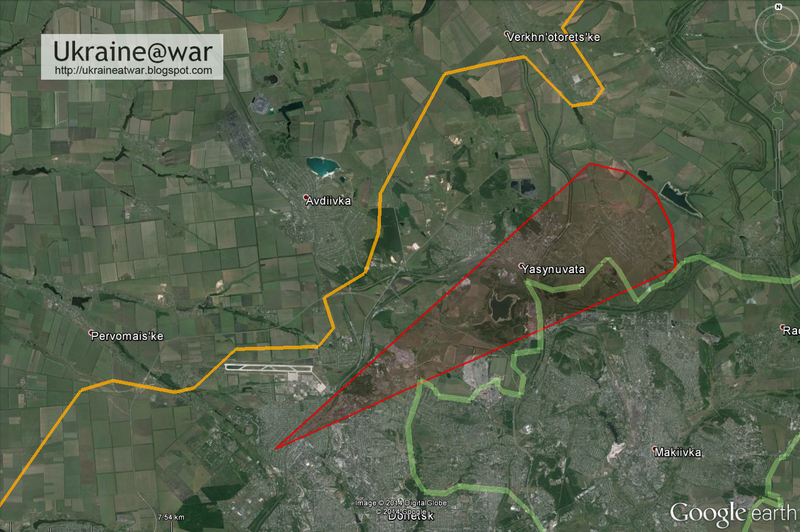 Yet it is hard to believe that Ukraine would fire simultaneously onto the SAME civilian area as the Russians do! If this shell came from Russian side, ALL of them came from Russian side... even if they may have come from another direction. Also see: What's the problem with OSCE and their report about School No63? 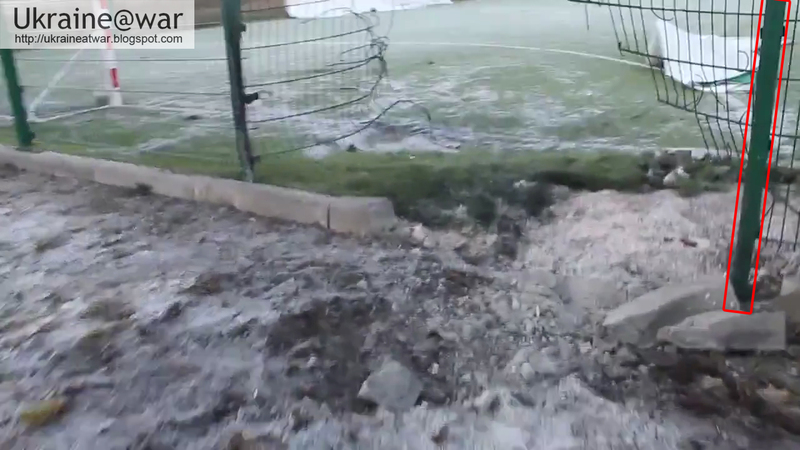 Also see: Is strange impact crater proof that Ukraine fiing at the school? 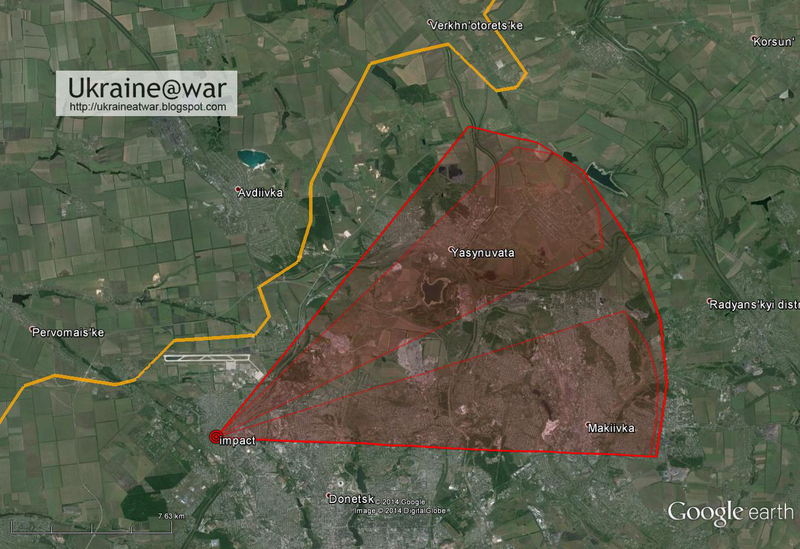 Also see a similar analysis: Russia shelled Ukraine with Smerch rockets FROM RUSSIAN TERRITORY. 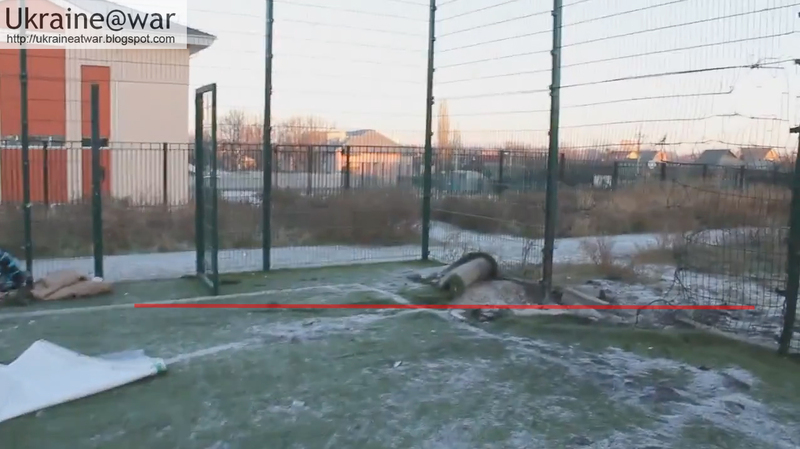 show that the explosion was IN FRONT of the fence (red line)? No. That pole is bend as can be seen in the yellow rectangle (click to enlarge). 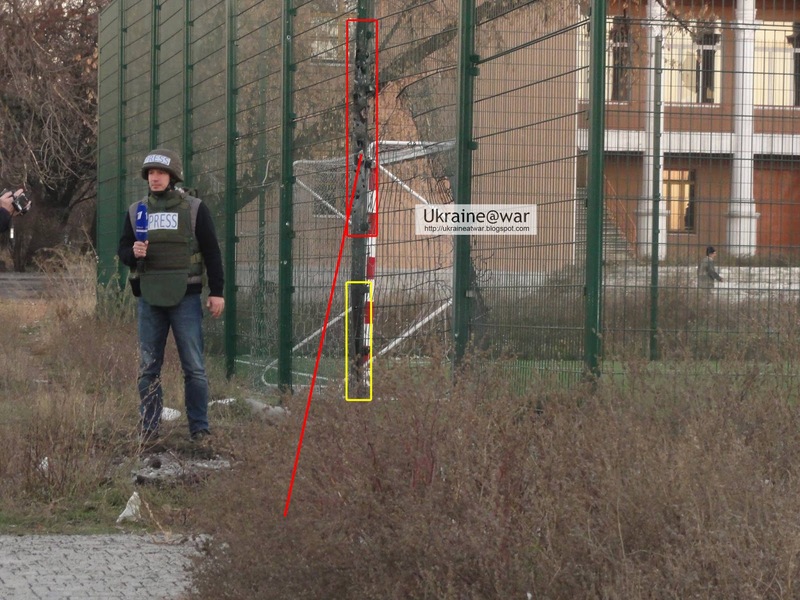 And even this Russian soldier/reporter says the shell did not hit in front of the fence. "We were playing soccer near School No. 63. At first everything was quiet. 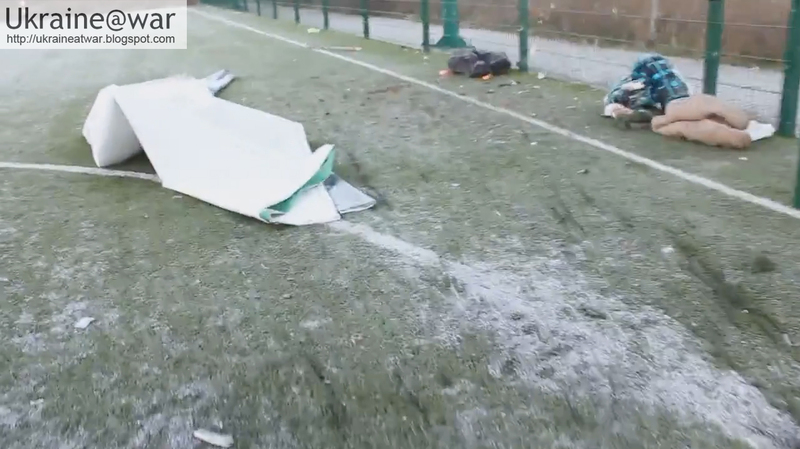 Then a shell suddenly fell right on the school. 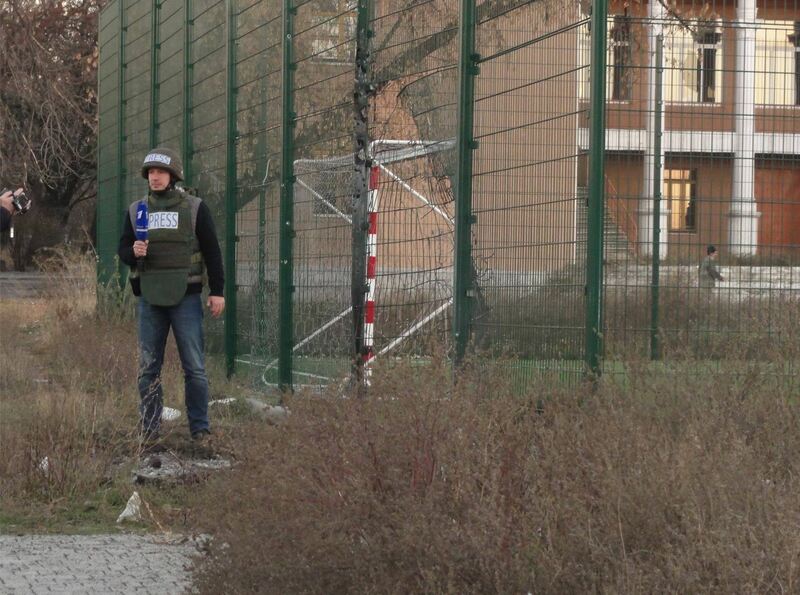 We tried to run away, there were 9 of us, and there at the exit, near the fence on the field, a shell landed. Three guys managed to run away, it killed two of my friends, and four others, including me, were injured. The first shell landed -- I didn't see it exactly -- I was too distracted somehow when it fell. 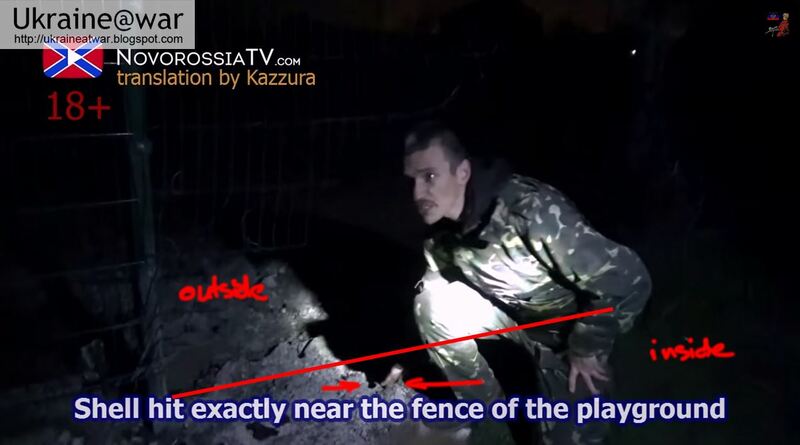 But the second fell right under the playing field, not going into it, but under the fence, under the barrier. The fence exploded, so it turned out I didn't manage to run up to it, and it [the shell] caught me." 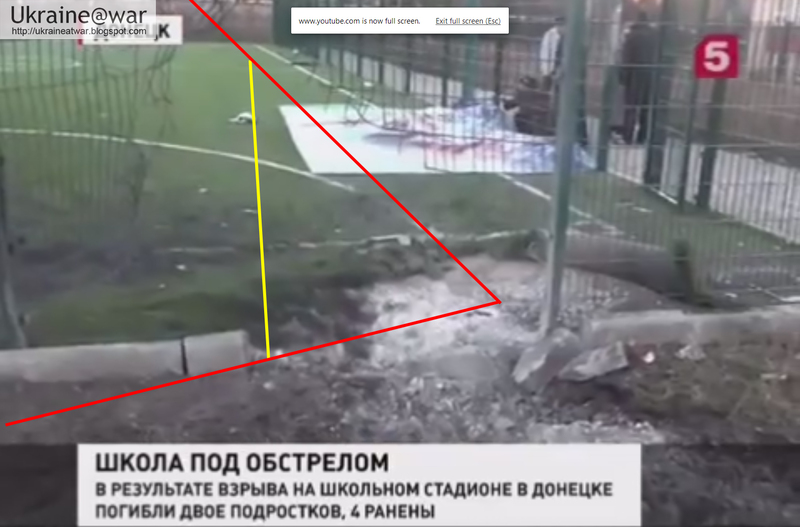 With this additional information we can conclude this (AGAIN but now spelled out): the shell came exactly between the fence and the stone bar. 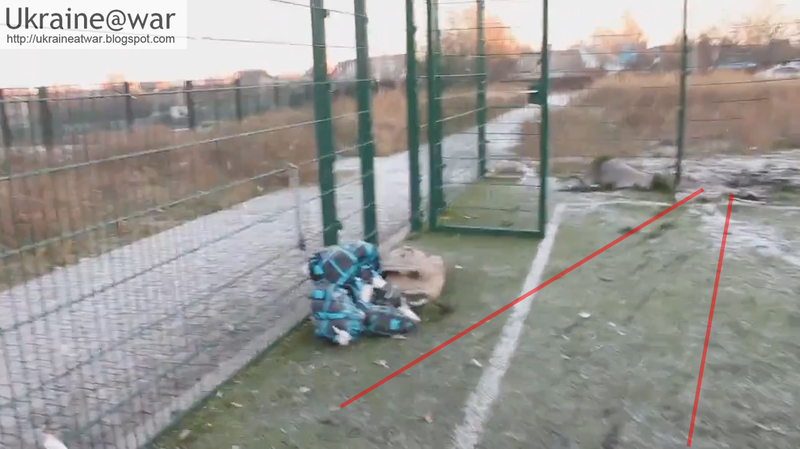 it hit the fence first at an high angle, indenting it and guiding it so it landed exactly behind the stone bars. Good Work. Thoughts and Prayers continue with those innocents murdered today. Thank you. Does anyone believe the lies coming from the Russians and the terrorists? and they got it, in evening your blog was named on it. the sad thing is, noone really cares. Noone seems to be seeking the truth, only excuses for their own point of view. Such a posts like yours are rare exceptions.